The Dacia Duster will have a Renault version that will be sold only in certain markets. The Renault-Nissan factory in Russia will produce this version and the first images of the model were published. 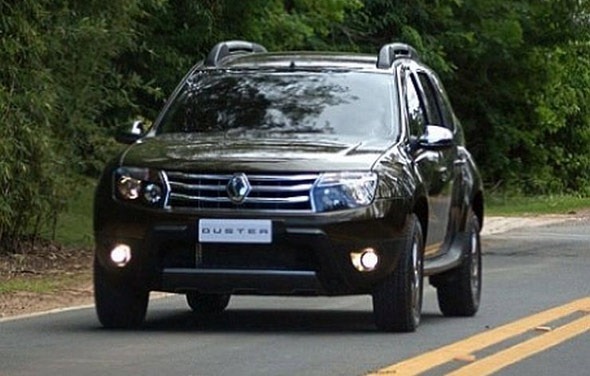 As seen from the photos, the Renault Duster is different from the version produced in Romania. The first change occurs at the front grille, which receives a large Renault logo and a set of cross bars slightly tilted inward, similar to those present on the Latitude. The lights, the headlamps, the hood and the front bumper retain the old design, except for small changes – lights do not have a background so dark and the front bumper has a slightly changed form. On the backside, the door get a chrome, replacing the plastic plate provided on the Dacia Duster. We can also see a logo discreetly announcing a new in the engine range: 2.0, which means a 2.0-liter naturally aspirated production of Renault Nissan, which features most likely 140 HP and 195 Nm. The Renault Duster will be offered in both manual transmissions with six reports and all six-speed automatic transmission, which is not yet offered in the range of the Romanian car manufacturer. The Duster’s interior is also changed for the Russian version. More specifically, the center console has a different air conditioning control, which looks more modern. In addition, the central air vents have been repositioned, and above them was created a storage space. Also, the audio system is more complex, equipped with a large display. The windows controls have been also moved on the doors. According to some rumors the wheelbase has increased by 40 millimeters, but the luggage space is still 475 liters. If the rear seat is folded, the cargo volume reaches 1,600 liters, so the 40 mm above have been assigned to the rear passengers.